The above info came from Berserk Story, and was edited by yours truly (contact me). The image came from The Altar of Fire. Berserk is a gothic tale set in the Middle Ages which chronicles the life and trials of Gutts, a very strong and highly skilled swordsman, as he fights against elements so that he can determine his own destiny. This theme of taking your destiny in your hands and not letting fate do it for you is one that is constantly appearing throughout the series. At the same time, the question of how far a person would go and how much he would sacrifice to achieve his goals is also explored, and for this series, to its terrifying end. 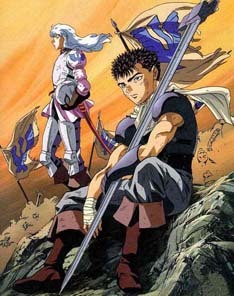 Unlike many TV series in recent memory, as well as the ones currently on air, Berserk tells the story in one tight continuous arc, with the events in one episode smoothly flowing into the next. It doesn't have the "episodic" feel where one episode can be considered a "stand-alone". In addition, this show has by far the most realistic rendition of life during the medieval era. Note: There are no more episodes after 25, nor are there any plans to produce more (that I am aware of). The above description came from Black Sun Over Midland, and was edited by yours truly (contact me).